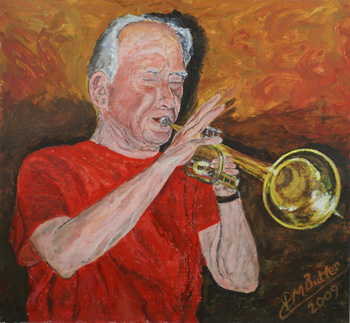 "Bob Thomas on Trumpet" Acrylic jazz portrait commission by Peter M Butler. I chose Hertfordshire based Bob Thomas & The Thomcats amongst the first group of bands to feature on JazzandJazz.com not only because Bob is a good friend who lives in the same village as me, but because he has a jazz pedigree reaching way back. Bob purchased a trumpet from Pat Halcox, Chris Barber’s trumpeter, who gave him private lessons. To this day Bob laments the theft of that trumpet from his car, especially as it was a Doc Severinson. In those early days Bob played with a number of top bands and rubbed shoulders with the likes of Acker Bilk and Terry Lightfoot. He featured regularly on Thames jazz cruises at Windsor and Maidenhead, mainly with Len’s Seattle Six band. The tales he has to tell about those cruises are classics. Bob recently celebrated his 80th birthday and like so many jazz musicians he is still going strong. He formed The Thomcats in 2000 since when they have entertained thousands with the pizzazz, rhythm and harmony of their “happy jazz”. 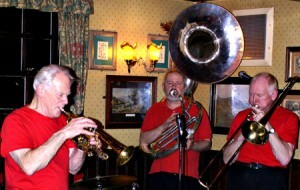 Their repertoire swings along to very best of New Orleans and Trad Jazz through to contemporary favourites. Their numbers include masterpieces by great composers and performers such as Louis Armstrong, King Oliver, Jelly Roll Morton, Count Basie and Duke Ellington – plus compositions by George and Ira Gershwin, Cole Porter, Jerome Kern, Hoagy Carmichael and Antonio Carlos Jobim. My wife and I are pleased to have produced a brochure and flyer for The Thomcats using a selection of my jazz photographs taken as reference material for my jazz portraits of Bob on trumpet, his drummer Pat, banjo player Roger and Tim on sousaphone.